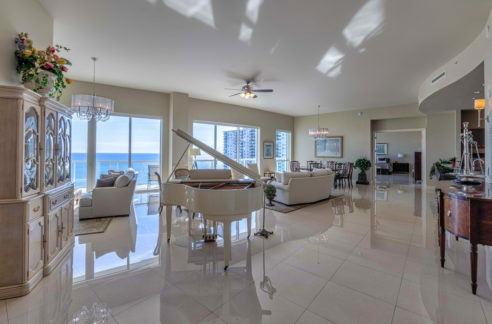 Experience the ultimate in luxury living in this beautifully appointed 2 story designer loft home at the extraordinary Plaza at Oceanside and enjoy almost 3200 square feet of living space. Enjoy 2 bedrooms plus loft and 3.5 baths with floor to ceiling 22 ft. glass walls With Chihouly inspired glass fixtures, 32 inch white Saturnia tiles, this exquisitely decorated residence provides a sleek, modern experience. The residence features an open floor plan perfect for entertaining with a mirrored wet bar and a 42 bottle wine cellar with storage. The kitchen features stainless steel Viking appliances, Poggenpohl European cabinetry, granite countertops and backsplash and a wine and beverage refrigerator. The family room features a custom built-in entertainment center and beautiful exterior views.